What Can Happen to the Renal System as a Result of Excessive Drug Use? The information in this article is designed for educational purposes and should not be used for diagnostic purposes. If anyone believes they have a problem with the functioning of their kidneys or a substance use disorder, they should contact a licensed medical professional. Excretion refers to the process of the body eliminating toxins or waste products. The excretory system consists of numerous organs in the body that all contribute to the removal of waste products and toxins. The major parts of the excretory system include the sweat glands, the liver, the lungs, and the renal system or kidneys. This article will focus on substance abuse and renal functioning (kidney functioning). The majority of the metabolism of substances in the bloodstream occurs in the liver, but the majority of the elimination of waste products occurs through the kidneys (through urine). The job of the kidneys is to filter blood pumped throughout the body and to create urine. Urine is composed primarily of excess fluid, waste products, and toxins. After it is formed in the kidneys, it is then transferred to the bladder where it is stored until it is excreted. The kidneys and the bladder work together to stabilize the amount of electrolytes in the blood and prevent fluid and waste buildup in the system. Thus, the majority of the drugs that individuals take are eventually excreted through this process. 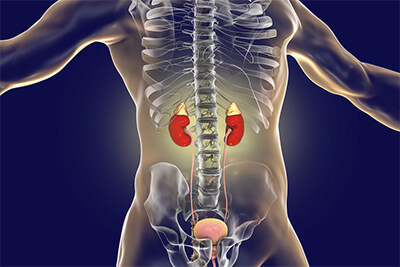 Some of the significant health conditions that can affect the functioning of the kidneys include infections, diabetes, high blood pressure, and kidney stones (nephrolithiasis). Drug abuse can also impact the functioning of the kidneys. If the kidneys are not functioning properly, the effects of drug use can be amplified, and this can lead to further issues with the kidneys. For instance, individuals who develop tolerance to alcohol or drugs often significantly increase the amount of the substances they use, and this can contribute to problems with toxicity and kidney functioning over time. Chronic abuse of drugs or alcohol can lead to severe kidney damage and even to kidney failure. Substance abuse may directly damage the kidneys or may indirectly damage them through some other process, such as increased body temperature or rhabdomyolysis (the breakdown of muscle tissue in the release of cells in the bloodstream). Numerous drugs of abuse can affect the function of the kidneys. Nicotine contained in tobacco products is a toxic substance, and it can be toxic to the kidneys. Use of nicotine increases blood pressure, and this increase can accelerate damage to the kidneys. Nicotine also exacerbates kidney disease and increases the risk of kidney failure in individuals who have certain medical conditions such as type I diabetes. Alcohol Chronic heavy use of alcohol can lead to direct damage to the renal system, as the chronic use of alcohol can directly damage nearly every organ in the body. Such use can significantly alter the structure and function of the kidneys. Alcohol use also affects the liver and how the liver and kidneys work together. Damage to the liver can affect kidney functioning. Even moderate to mild alcohol consumption will affect any existing condition of the liver, which will indirectly result in kidney damage. It is well documented that chronic heavy consumption of alcohol can result in liver disease. Because the liver and kidneys work together, the effects of liver disease can extend to the renal system. For instance, it is not uncommon for individuals who have cirrhosis of the liver to also have enlarged kidneys. Individuals with liver damage as a result of cirrhosis of the liver are also at a higher risk for acute kidney failure and issues with electrolyte and sodium imbalances that can also lead to kidney damage. Cocaine is a central nervous system stimulant that has been demonstrated to have significant detrimental effects on kidney functioning. Cocaine use, particularly heavy and chronic use, can lead to a condition known as rhabdomyolysis where muscle tissue breaks down and enters the bloodstream. This condition can lead to kidney failure. Nearly one-third of individuals who are admitted to emergency rooms with cocaine-related issues will also develop acute kidney failure. Cocaine can also lead to renal infarctions (dead tissue on the kidneys), and chronic use is associated with cardiovascular issues, such as atherosclerosis in the walls of the renal arteries (the buildup of plaque). This can also lead to kidney damage, disruptions in kidney functioning, and issues with abdominal pain, nausea, and vomiting. Ecstasy (MDMA) is a synthetic drug that is classified as a dissociative hallucinogenic drug. It produces hallucinations and feelings of leaving one’s body or being out of touch with reality. The drug has numerous side effects that can lead to issues with renal functioning, including its ability to increase body temperature (produce hyperthermia), which can lead to dehydration. This can result in rhabdomyolysis and acute renal failure. The drug can also exacerbate hypertension, and this can lead to acute renal failure or damage to the kidneys. Household items, such as spray paint, cleaning fluids, and glues, are often used as inhalants by individuals attempting to achieve the psychoactive effects associated with these substances. A toxic chemical known as toluene, which is a component of many substances used as solvents or glues that are abused as inhalants, can lead to direct kidney damage when ingested. The damage will often occur as the result of lesions to the kidney. It may also produce a serious condition known as renal tubular acidosis in which acid builds up in the blood and can lead to chronic kidney failure. Opiate drugs consist of numerous pain-relieving (analgesic) prescription drugs and several drugs that are illicit, such as heroin. These are high-profile drugs of abuse in the United States, and their abuse is associated with numerous health issues. The drugs can be taken orally, ground up and mixed with liquid and injected, and even snorted. There is a significant risk associated with injecting any type of drug when individuals share needles and may contact a blood-borne virus. Opiate abusers who inject drugs are at a high risk to share needles and may contract HIV-associated nephropathy, which is a kidney disease that often affects individuals who are intravenous drug users and have HIV. This condition may progress to end-stage kidney failure and death. In addition to the risks associated with injecting drugs, the use of opiate drugs can result in kidney damage through numerous mechanisms. Intravenous drug users (e.g., heroin users) are more likely to contract fungal and bacterial infections, which can result in acute kidney inflammation. Intravenous drug users have an increased risk of buildup of protein in organs and tissues associated with chronic infections and inflammation (secondary amyloidosis). This can progress to kidney failure. Opiate overdose can lead to rhabdomyolysis, which can amplify the risks of kidney damage. Many opiate drugs also contain acetaminophen (e.g., Vicodin and Percocet). Taking large doses of acetaminophen or chronic use of acetaminophen can be associated with liver damage, which can affect kidney functioning. Long-term use of acetaminophen can also produce analgesic neuropathy, an irreversible condition that can progress to renal failure, or chronic kidney failure.